So you’ve got an upcoming hospital stay and you’re not sure what to bring? After several dozen hospital stays of varying lengths, most averaging two weeks, during my son’s first three years of life, I’ve got plenty of experience in knowing what is and isn’t useful in a hospital! Even these days, when we’re in a period of relatively few long hospital stays, I keep the suitcase packed and stocked. Partly because, with my son’s medical conditions, you just never know when you’ll suddenly be thrown back into long stays, and partly because most of the things in the suitcase were purchased specifically for the hospital and I truly have no other place to keep them. My hospital packing is actually two-pronged. I have the suitcase, whose contents rarely vary. And then I also have what I call the “fun bag.” (OK, I only call it that to myself. I don’t think I’ve ever said that out loud.) The “fun bag” is for all the “current” things that we’ll want while we’re at the hospital. My knitting, a book, my notebook, his current favorite toys, our bedtime reading book, technology and chargers, etc. And then he is allowed to pack some number of stuffed animals and toys in his backpack, as well. Your needs will obviously vary depending on your child’s needs, your individual needs and wishes, your child’s age, and what is available at your hospital. So here’s what’s in my suitcase, and why. Packaged blended food (Real Food Blends), enough to last a week. My husband or someone else can either bring us additional food if we’ll be staying for longer than a week, or they can mail it. Our hospital is reasonably supportive of blended diets (DS gets real food blended up through his feeding tube) but I prefer to bring our home food and let him order from the menu for oral food. I consider asking them to blend up something from their menu as a last resort. Immersion blender. I need to mix the RFB with water to make them thin enough to go through the pump, and I do this with the blender. His feeding pump and feeding sets. At some point, our hospital switched to Kangaroo pumps, and their pumps don’t work well with blended diets. I just bring our own. I also have several extensions in the suitcase, but generally just use hospital provided extensions. Diapers. Teddy’s in a size 7, and our hospital doesn’t stock that size for some bizarre reason. I keep a pack in the suitcase. Clothes. This is a variety of hospital gowns I’ve made him, a set of commercial pajamas, underwear and socks, and a few shirt/sweatpants combos. There’s a hoodie for him, and also a pair of slippers, though he thinks hospital socks are the best things ever. I sewed up a soft fabric basket that holds his clothes in the suitcase to keep them all together and to make them easy to find quickly. Activities. I keep an inflatable ball in the suitcase, as well as some coloring books and markers. (I don’t pack crayons, but that’s because I keep crayons in my every day bag.) A floor cloth – I think this is technically a beach cloth? I found it on clearance at Toys R Us. It folds up small and we use it on the floor so he has a clean place to play. A sippy cup. He’s technically too old for sippy cups, but I find they’re still handy for when he wants to drink but doesn’t feel very well and wants to lay down. Personal care items. I pack special soap and lotion, his toothbrush and toothpaste, and nail clippers. Last minute, we put his weighted blanket in the suitcase, as well. Things to make the food. A two cup Pyrex cup. Some spoons and a knife. A bottle brush, though I think this is leftover from when I used bottles to store pumped breastmilk. Clothes. I keep three sets of clothes in my suitcase, so combined with the one I’m wearing when I arrive, I can go three days between laundry. I pack extra socks because socks get nasty in hospitals. A pair of slippers. Pajamas. My hospital pajamas are yoga pants and a shirt – so they’re not obviously PJs. I feel ridiculous talking to doctors half my age when I’m wearing my jimjams, so I prefer to look like I’m actually wearing clothes regardless of what time it is. A hoodie. A spare belt. I usually wear skirts, but we had a hospital stay once where it was so cold in our room that I mostly wore a pair of jeans I had packed, but I had no belt and spent two weeks pulling up my darn pants. NEVER AGAIN. Like with his clothes, I keep mine in a soft fabric basket inside the suitcase. Personal care items. All the usual things. Deodorant, brush, toothbrush and paste, hair ties. I cover my hair, so I have a few casual covers in there. Some OTC meds like allergy and advil. Travel size shampoo and conditioner. Good lotion. Scissors. (I don’t shave, so I don’t pack a razor, but obviously you’d want that if you do.) Pads, enough for a whole cycle. Miscellaneous things that make me happy. Tea packets. A hot chocolate or cider packet or two. Gum because I grind my teeth when stressed and this somewhat mitigates that. An insulated, lidded mug. Envelopes and stamps. I don’t use these as much any more, but when my other kids were younger, they enjoyed getting mail from me from the hospital. Notebook and pen. I take notes during rounds. Some moms keep a journal. Humidifier. I found a small portable humidifier at Target one year. It holds a water bottle. Hospital air is so very very dry. This is one of my favorite hospital bag things. An internet television device. I call mine my Fauxku because it’s like an off brand Roku. I can hook it up to the hospital TV and get Netflix, so we’re not limited to the movies the hospital provides on the entertainment system, if they have one. Our hospital does NOW but hasn’t always. Spare cords. I have a handful of phone, kindle, and ipad cords, and an extra cord for my laptop. Because I can always remember my laptop but for some reason, I can’t always remember the cord. Two empty tote bags. Because you just never know. Many feeding tube users and parents of feeding tube users have discovered the numerous benefits of a blenderized real food diet. Thinking of starting a blenderized diet? Already taken the plunge? You’ll want these five must-have items. A Good Blender. Most people who use a blenderized diet prefer a BlendTec or a Vitamix and find that straining the blends isn’t necessary with these blenders like it can be with other brands. I personally have used a BlendTec for 6 years now and LOVE IT. Follow the instructions for what order in which to add food, make sure there’s enough liquid to get a good vortex, and run it twice on soup. Boom. These blenders are pricey; check with the manufacturers about the availability of refurbished machines. Nice syringes. Regular rubber-plunger syringes stop working after a VERY short period of time. Many blenderized diet people prefer syringes with an O-ring instead, such as the Miracle Syringe. Oddly enough, these syringes are often sold by stores that cater to squirrel rehabbers. O-Ring syringes are also sometimes available through DME suppliers, so be sure to ask before you pay out of pocket. 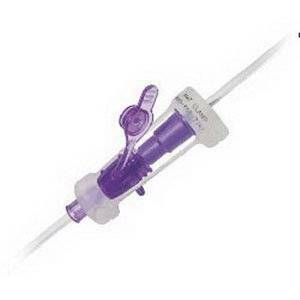 Miracle Syringes are Catheter-tip, but you can also get adapter tips to make them into a slip tip if you prefer to feed directly into the button, without using an extension. If you use EnFit, NeoMed makes O-Ring EnFit syringes that you can get through your DME or online medical supply stores. Why bother with getting an O-Ring syringe? They last forever and glide like an Olympic ice skater. I bought a handful of syringes in 2013. I still use them. They still work like a dream. Extensions. Some people feed their blenderized diet directly into the buttom using a slip tip syringe. Some people prefer to feed through the more typical Y-Port extension. But many tube feeders prefer one of the two single-port (or bolus port) extensions – the right-angle bolus extension or the straight bolus extension. I personally prefer the right angle bolus extension for pump feeding (no med port to pop open) and the straight bolus extension for syringe feeding (requires less pressure, in my opinion). Get a few of each from your DME and see what you like. Storage for your blends. There are many different ways to accomplish a blended diet. Some people prefer to blend by the meal, so they cook breakfast and blend it up, then cook lunch and blend that up, make a snack later, then dinner. If that’s you, you have no storage needs. Others prefer to blend either one time for the whole day, for once for a couple of days, or once for a week or two. If that’s you, you need a good way to store your blends. You have so many options. Our family blends every 2 weeks, and I freeze blends in glass jars (leave plenty of headspace, don’t crowd the jars in the freezer, and don’t screw the lids on until frozen). Other families prefer to use any variety of plastic containers. 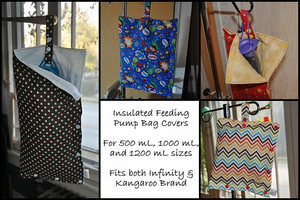 Some use breastmilk bags. 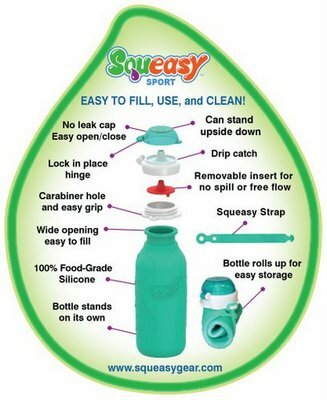 A relatively newer product on the market that is a favorite with many blending families is Squeasy Gear. A way to keep your food safe on the go. Formula is much easier in this regard. It’s shelf-stable. But actual food isn’t – particularly not when blended up. Many feeding tube users find they prefer to carry their feeds already drawn up into syringes for feeding on the go, rather than carry a single syringe and a jar or bottle full of food. Refilling syringes can get messy and usually requires more of an interruption to your day, whereas bringing prefilled syringes reduces the hassle factor quite a bit. If you find you prefer toting prefilled syringes, our Syringe Tote is for you. 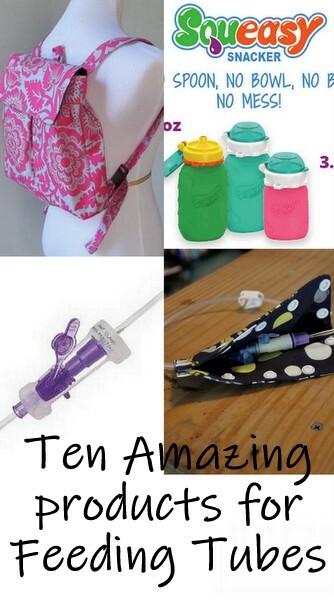 I’m so excited about this newer addition to my line of feeding tube accessories! It’s double-insulated, has two large compartments inside, and one small compartment, and it’ll hold 5-6 60 mL full syringes plus an ice pack and small accessories like a 20 mL syringe, Gtube cushions, a few predrawn liquid medications, etc. You’re at the store when suddenly you realize your (or your child’s) feeding tube balloon popped! Or it got pulled out and landed who knows where! Or you’re starting a feed, but it won’t go in! Or you’re stuck somewhere and you know you need to feed or hydrate, but you didn’t bring your supplies! Or you thought you brought your supplies, but when you get to the clinic appointment hours away from home, you realize you forgot to pack an extension! Take a deep breath and don’t sweat it because you have everything you need right in your handy Feeding Tube Emergency Kit. A spare tube. My son uses a Mic-key button, and I just have an old button in a plastic bag in our emergency kit. I chose a button that actually broke so we changed it early, it’s not too gross looking, and I cleaned it off pretty good before packing it. The balloon is broken, but it’s still functional as far as ability to feed, and it’s much more compact than the foley catheter the hospital gave me for emergencies. The purpose of this spare/emergency tube is two-fold: to hold the stoma open, and to allow feeding/hydration. It can be held in place with tape and is only a placeholder until a new button can be placed. If you use a j-tube, obviously this plan won’t work, unless you can use G in emergencies. You know your own situation best. If your tube uses the blue stiffener/introducer, be sure to pack that, too! Wet wipes, individually packaged. Tubie life is usually full of somewhat unexpected messes to clean up. Wet wipes can help. Lube, small packet. Ask your child’s doctor, they might be able to give you one or two. Handy for tube changes. I use a big bottle of astroglide at home, but keep a packet of generic medical lube in our kit. Slip tip syringe(s). I prefer to keep two sizes of syringes in our kit – a 5 mL (the one that comes in the button kit when you change them, otherwise ask your pharmacy, or buy on Amazon) and a 10mL (which I bought on Amazon). Slip tip syringes will fit in the balloon port of balloon buttons, and will fit directly into the port of any type of button, without needing an extension. These are just handy to have. To re-inflate the balloon, for emergency hydration needs, for unexpected medication needs, for “oh shoot I forgot the extension and it’s time to feed” occasions. Feeding someone 500 mL with a 10 mL syringe isn’t a good time, but it’s better than starving. Spare extension. I prefer to pack a 12 inch Y-port extension, since it’s so versatile. Emesis bag. Technically I don’t keep this in our tubie emergency kit – I keep it handier than that. Though my tubie doesn’t puke as much as he used to, he still occasionally vomits and having a bag handy makes it much easier. Our whole family has, at one time or another, ended up using the emergency puke bag I keep handy… You can swipe one from the emergency room or buy them in bulk on Amazon. I haven’t regretted buying them. Change of clothes. I also don’t keep this in our tubie emergency kit, but thought I’d mention it. It never hurts to have a spare set of clothing. Storage Bag. I keep my kit, as you can see, in a small waterproof bag. The bag itself has come in handy from time to time, as well! I do make and sell small waterproof bags, but any number of small containers would work for a tubie emergency kit. A pencil case, a small plastic box, a makeup bag, etc. New to Feeding Tube life? One thing the doctors never tell you is how many products are out there to make your life easier. Here are ten amazing products made just for tubies – often made by other tubies or parents of tubies. A good backpack. 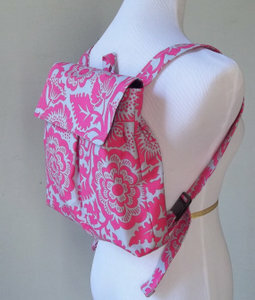 You can usually get a backpack for your feeding pump from your DME supplier, but if you want something cuter, there are many options available online. The one pictured here is from retrofied on Etsy. Insulated Cover for the Feeding Set. Yes, this is one of my products, but I have to say, it’s genius. After waking up in the middle of the night to refill Teddy’s feeding pump bag for several months, I decided there must be a better option. Four prototypes later…. voila. Holds an ice pack and keeps the feed cold all night or all day. aaaahhhhh….sleep. Connector Cover (one of my products). The Connector Cover is genius – it covers up the connection between the feeding set and the extension to keep all those ports closed and fastened together. Help stop bedtime leaks! Also fantastic for stopping those curious little fingers from pulling apart the connection. An alternative to the fabric options available, this clamp made by AMT also aims to hold the delivery set to the extension. Cord Keeper (another one of my awesome products). 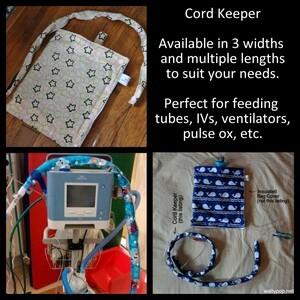 The Cord Keeper covers up and helps manage the tubing associated with feeding tubes. Some families find that these help reduce nighttime tangles. Some tubies prefer to keep their tubes covered up. And some tubies have several tubes to keep from tangling. Cord Keepers help with all of that! Caribiners. We use caribiners to clip the feeding pump backpack to my backpack, to hang the delivery sets from anything handy, to clip the insulated bag that holds his pre-drawn bolus syringes to my backpack. Cord Clip. 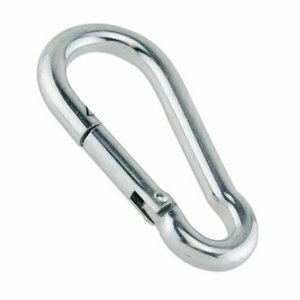 (One of my own products) These handy clips help manage medical cords. We’ve used ours to hold excess tubing between feeds, as well as to manage cords in bed. They can be used to hold syringes for gravity feeding, and have countless other uses as well. Squeazy Gear. We haven’t used these soft bottles ourselves, but I’ve heard such rave reviews from other tubies and tubie parents. 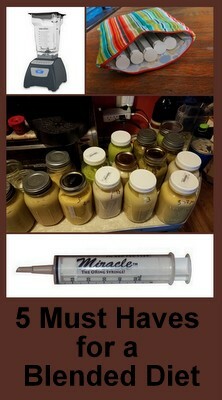 Particularly suited for those following a blenderized diet, these bottles hold your feed and connect to your tube. 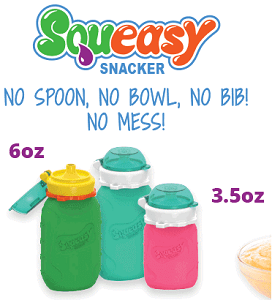 Easy Squeazy. Waterproof bed pads. If you can get the ones from the hospital, go for it. If you can’t, these are a nice alternative. Absorbent and waterproof, these protect your mattress from overnight leaking – whether that leaking comes from overfull diapers or from inadvertent tube disconnections or from vomiting. Save your mattress! Velcro Straps. Oh, so many uses. I still carry five of these in my “tube emergency” kit in my backpack. Syringe Holster. Many tubies have several meds they take through their tubes. 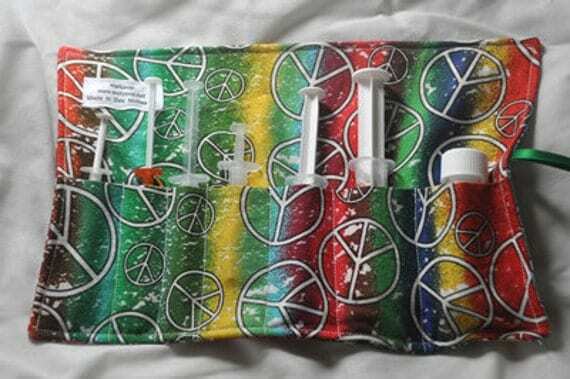 Sure, you can carry those syringes in a ziplock bag, but the Syringe Holster keeps them organized and protected. I will admit, Brother Bear is NOT my favorite Disney movie. By a long shot. But I was planning out movie nights at Gymnastics one day, and I had to go by memory of what movies we own. So… Brother Bear it was. Yeah, Genna was expected to eat one bite of broccoli. This single bite of broccoli was preceded by 30 minutes of crying. The mousse wasn’t very smooth. I’m not sure why. Probably because I’m not skilled.